Wow. It's hard to believe this has sat untouched for nearly a year. I'm mostly happy with how it came out (even if Chell is mildly disproportionate). It required a lot more painting than I've been doing lately (everything seems to be vector based or 3D for me at the moment). Like Continue Testing..., I started this at a point when the only real information available about Portal 2 was that it was set hundreds of years after Portal and that the Aperture facility was overgrown with plant life and was falling apart. 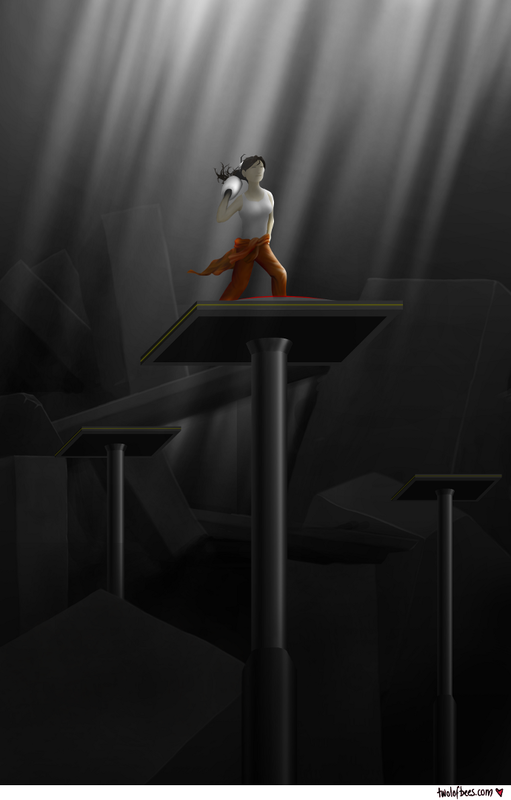 I found the idea that Chell might need to climb platforms to survey the path ahead sort of compelling. It didn't quite turn out that way through.